Stand Up Paddle Lessons: Sessions that take approximately 1 hour long, held in Funchal area, according to the conditions of the sea. 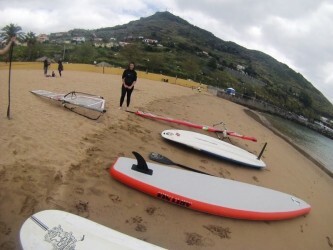 Stand Up Paddle Lessons: Sessions that take approximately 1 hour long, held in Funchal area, according to the conditions of the sea. May be held in the bay of Funchal, with output of S. Lázaro, Formosa beach near the Yacht Bar Beach, in S. Tiago or in the hotel of the customer, since it has access to the sea. Includes insurance, transport to and from the hotel and monitoring a monitor with stand up paddle. Meeting Point: Hotel Pestana Carlton. Funchal area, according to the conditions of the sea. May be held in the bay of Funchal, with output of S. Lázaro, Formosa beach near the Yacht Bar Beach, in S. Tiago or in the hotel of the customer, since it has access to the sea.